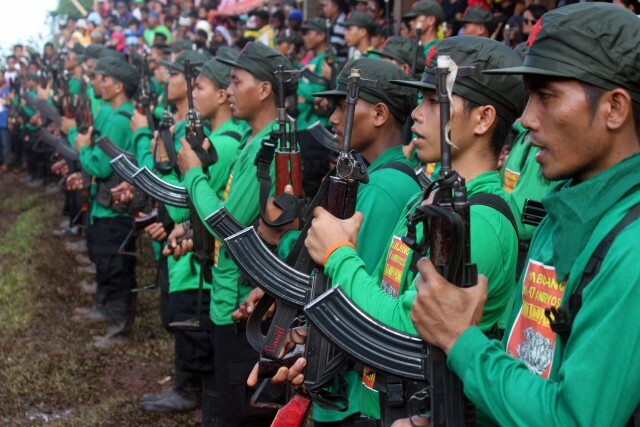 New People’s Army inflicts heavy losses on Armed Forces of Philippines | Fight Back! The Regional Operations Command of the New People’s Army (NPA) in Southern Mindanao commends the 1stPulang Bagani Battalion for carrying out revolutionary justice and inflicting heavy casualties against AFP (Armed Forces of Philippines) troops following three coordinated tactical offensives in Paquibato and Calinan Districts, Davao City on February 16. At least 12 AFP soldiers were killed while more than 20 more were wounded. In unrestrained fury over the toll, AFP troops manning the checkpoints after the successful NPA attacks retaliated by taking aside two civilians and summarily killing both of them. A company of Red fighters attacked the detachment of the 72IBin Sitio Binaton, Brgy. Malabog in Paquibato District at around 5:30 in the morning. The military action was in response to the masses’ demand to punish the mercenary enemy troops, especially in perpetuating and protecting the illegal drug trade in the district and in neighboring areas. In exchange for monthly payola, the detachment ensured unhindered traffic of drugs between the city’s districts and provided security for notorious drug operator Neptali AlfredoPondoc, who was executed by the NPA on January 23. A Red fighter was martyred in the engagement. One enemy was killed while several others were wounded. At around 4:00 in the afternoon, the 5-truck reinforcement of the 3IB was hit in Brgy. Lamanan in Calinan District. Three of the five KM450 trucks were blasted and upturned when several command-detonated explosives were triggered by Red fighters, killing at least 7 and severely wounding more than 10 enemy troops. Thirty minutes later, another 3IB reinforcement onboard 2 military truckswasagain blocked down by command-detonated explosives in Brgy. Lacson, Calinan District, killing 2 and wounding 17 AFP troopers. While cordoning off the highway to the clash sites, AFP soldier stook aside for no reason civilian commuters Roel Satingasin of Brgy. Tamugan and Ariel Gelbero of Brgy. Lamanan and summarily killed both of them in Calinan. AFP troops, by their very disposition, are incapable of resisting the fascist nature sto take it out on hapless civilians when they suffer heavy casualties in the battle field. The NPA assures the families that revolutionary justice will be meted out against the perpetrators of the heinous crime. The tactical offensives were carried out by the NPA as fitting punishment for the AFP’s numerous human rights violations of extra-judicial killings, illegal arrests, harassments and artillery bombardments that resulted to thousands of displaced Lumads and peasants during and after their so-called unilateral ceasefire. The heavy casualties inflicted against these fascist troops serve as revolutionary justice long demanded by the masses who continue to fall victim to state-sponsored terrorism. Despite their supposed millions in intelligence resources, the top honchos at the 10ID are beside themselves in rage that a series of tactical offensives have been successfully carried out by the NPA in broad daylight in Davao City. They are fuming at the mouth that the all-out war they so bullheadedly declared has completely backfired and is costing them men and means in the face of coordinated NPA offensives not only in the region but across the country.